Artwork of Krunch in Diddy Kong Racing. 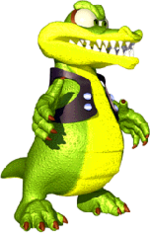 Krunch is a Kremling and member of the Kremling Krew, he is also an ally of Diddy Kong. Krunch's first appearance is in the game Diddy Kong Racing. Here, Krunch is sent by King K. Rool to investigate why Diddy Kong and several of his friends are at Timber's Island, and to see if they are hatching some sort of anti-Kremling plot. Instead of antagonizing Diddy and his friends though, Krunch ends up aiding them in their battle against the evil alien hog, Wizpig. Krunch has the worst acceleration and handling in the game, but has a very high top speed, making him the third-fastest racer. Krunch's top speed without bananas is 60 mph. Krunch makes a reappearance in Diddy Kong Racing DS; he seems to have somewhat of a bullying attitude in this game. Krunch is left relatively unchanged from the N64 version, but his changes are a small boost in his turning and acceleration, along with a small drop in top speed. In the intro, Krunch is seen with another Kritter, who shares the same model as Krunch, as he decides to spy on Diddy. The Kritters of Donkey Kong 64 wear the same skull-and-crossbones leather jacket as Krunch did in Diddy Kong Racing. The skull-and-crossbones does not appear in the Nintendo DS version. Krunch speaks in a hissing-like noise in the first cut-scene of Diddy Kong Racing DS. He says to the other Kremling, "Where are thosssssssse Kongssssssss going? I will follow!" However, he does not make any hissing noises when picked from character selection menu. Footage of the early pre-release build 1.964 of Diddy Kong Racing shown in the German N64 promotional VHS tape "Wieviel 3-D hältst du aus?" reveals that Krunch was named "Krash" at some point in development, though this name was already taken by another Kremling in Donkey Kong Country. Both the 2001 and 2003 builds of the unreleased Diddy Kong Pilot use Krunch's design for the generic Kritter player. This page was last edited on February 22, 2019, at 23:31.